Welding – it’s hard but at the same time absolutely rewarding career. If you’ve decided to become a welder in Tennessee, this article will be useful for you. There are some useful tips and facts as well as the list of the best welding certification schools in the state. There is plenty of welding training programs in Tennessee. Some of them are offered by high schools while others are provided community colleges or Tennessee Technology Center. Bradley Central High School is located in Cleveland. Oak Ridge High School is located in Oakridge, TN. Chatanooga State offers Welding Technology program that lasts one year. During your training, you’ll learn about blueprint reading, shielded metal arc welding, oxyacetylene cutting/welding, tungsten inert gas welding, and metal arc welding. Northeast State Community College is in Blountville, Tennessee. It has both a Combination Welding degree and an Industrial Technology Welding/Fabrication concentration. Pellissippi State Community College offers Associate of Applied Science in Welding Technology. 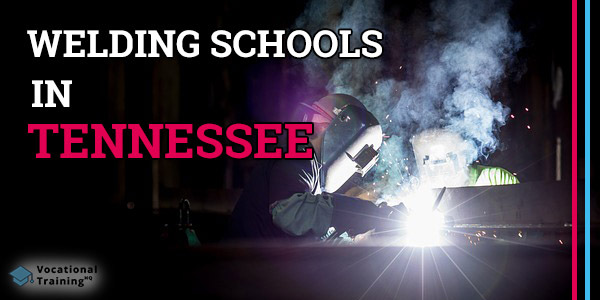 There are some technical schools that provide welding training programs in Tennessee. The Tennessee Technology Center has 10 campuses in the state: Knoxville, Hartsville, Athens, Elizabethton, McKenzie, Jackson, Sturgoinsville, Livingston, Morristown, Hohenwald, Crossville, and Crump. The Sequoya Technology Center is located in Soddy Daisy, Tennessee. Choosing a career, it’s clear, you want to know how much you can earn. That’s why we’ve prepared for you some data on the issue. An average median salary of a welder in Tennessee is about $38 770 per year or $18.64 per hour. At the same time, the top 10% of welders in Tennessee earn about $54 520 annually. Before making your final choice, we recommend you to learn more about welding. It will help you to understand this career better. In simple words, welding is a process of joining metal pieces together using tools to heat and melt them. It resamples soldering and brazing greatly but still, there are some differences. First of all, welding doesn’t require any additional materials while brazing and soldering require so-called fillers. One other point is that for welding higher temperature rates are necessary. Keep in mind that brazing allows producing stronger constructions then soldering. As you see, there is a lot of excellent welding schools in Tennessee. You just need to learn about offered programs and choose the one that meets your needs.